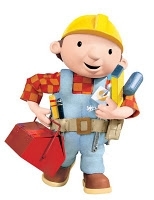 I never thought I would hear myself say this, but I am now totally grateful for all the hours I have spent watching episodes of “Bob the Builder” on television and DVD with my nephews when they were little. Who is “Bob the Builder,” you ask? And, pray tell, why am I talking about Bob the Builder? Because I recently came across an article in a UK newspaper where three social scientists put “Bob the Builder’s” “Can we fix it?” attitude, which introduces the possibility of doubt and uncertainty at the start of every project, to the test against self-affirming positive attitudes of complete certainty in various tasks (Pink, 2010). And according to these social scientists, the Bob the Builder attitude proved more effective. “Setting goals and striving to achieve them assumes, by definition, that there is a discrepancy between where you are and want to be,” explained Dolores Albarracin of the University of Illinois, one of the three researchers involved in the project (Pink, 2010). “When you doubt, you probably achieve the right mindset,” she said (Pink, 2010). What Pink (2010) says about this research is that ultimately questions such as the one Bob the Builder asks actually open up a dialogue, while the affirmation and declarations close it down. And this dynamic becomes clear in other areas of life as well. Good existentialists that we all are, we are all very familiar with the idea of uncertainty and unknowing, I’m sure at least some of you reading this have experienced, as I have, a modicum of doubt before starting projects at some point before in your lives. After all, Robert Burton (2008) tells us certainty is EVERYWHERE—especially in politics. In fact, I am not sure if it is even possible anymore to have a political discussion anymore without at least one member of said discussion completely convinced of his or her position and completely and forever immovable. And that is the case even if this person took the complete opposite position with 100 percent conviction the day before. Burton stresses that the feeling of certainty is just that—a feeling. He argues that there is compelling biological and neurological evidence to describe what he calls the “mental sensation of certainty as a ‘feeling of knowing,’” (2008) something more akin to the “tip of the tongue” phenomenon than something based on rational, conscious choice, backed up by libraries’ worth of evidence. According to Burton, the one thing we can be certain of is that certainty cannot biologically and neurologically exist. Therefore, we need to adjust our language—perhaps the first step—and our thinking—perhaps after we have changed the language. He suggests a switch from “I know” to “I believe,” although for many, especially in fundamentalist-based politics, a belief is often as strong as certitude, and we may need another word. Burton does however open up dialogue by posing a question about the placebo effect in double-blind medication trials? A patient could never be told he or she is taking a placebo, because the very question robs the placebo of its benefit. But the idea of a doctor knowingly prescribing a placebo to patient rather than the actual medication that the person needs would violate the doctor’s oath to do no harm? Bob the Builder does this every time he asks his team, “Can we fix this? (Maybe we can, maybe we can’t) and they all answer “Yes we can!” People who are not wedded to their certainty also allow for this questioning all the time. Existentialists have to hold the opposing beliefs of Being-in-the-World in this Moment, a.k.a., living, and the ever-Present specter of Death, and still be able to get up each morning, brush teeth, get dressed, eat breakfast, and go to work. However, I still have not seen anyone at the Republican debates hold the belief—with real certitude— that liberals and conservatives can coexist in harmony, and that liberals are not out to destroy conservative families and all that America stands for. But maybe if you are one of those stuck in the muck of dogmatic certitude, you can always try calling Dizzy, Lofty, Roley, and the rest of Bob’s crew! Can they fix it? I’m not so sure but I really really hope so! Burton, R. (2008. February 29). The certainty epidemic. Salon. [Online edition]. Retrieved from http://www.salon.com/2008/02/29/certainty/?mid=5728. Pink, D.H.. (2010, June 19). ‘Can we fix it’ is the right question to ask. The Telegraph. [Online edition]. Retrieved from http://www.telegraph.co.uk/finance/businessclub/7839988/Can-we-fix-it-is-the-right-question-to-ask.html.